St. John&apos;s has lost 10 in a row, but coach Chris Mullin says he isn’t giving up. Is there such a thing as a good or bad job in college basketball? Or does it all hinge on the coach? Can the right coach make it work anywhere? Or are there dead-end jobs where the competition is too difficult and the commitment of the school doesn’t match it? I’ve been involved in plenty of group discussions about this. Many times they have revolved around three schools: Providence, North Carolina State, and St. John’s. There are some people who think no one can win at these schools anymore. I think someone can. Ed Cooley is proving it at Providence. Kevin Keatts is the latest to try it at North Carolina State; it’s his first year but he did have a nice win over North Carolina Saturday. Then there’s St. John’s and coach Chris Mullin. It’s not working out well for the school’s living legend. The Johnnies have completely collapsed in the last month and are 0-10 in the Big East. It’s been painful too; seven of the losses were by 7 points or fewer. Coming up next are games against Xavier, Duke, and Villanova, so it will only get worse. 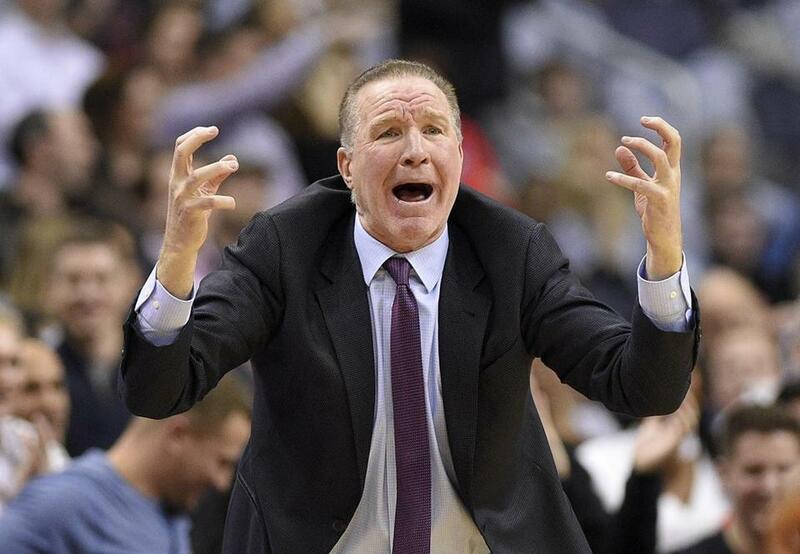 Despite all the bad news, Mullin is determined to see it through. “That’s the easy thing, to give up,” he told reporters in New York. “That’s not happening. That’s not what anyone came here for, but we’re going to work through it. “I don’t know that word. I don’t know that ‘give up’ word. I’m not about that at all. I’m about jugular vein. Keep coming, keep fighting, and keep throwing blows. Keep showing up. That’s what I’m about, and that’s what my players are about. Fighting words, to be sure, but his record is not impressive: 32-55 overall and 8-38 in the Big East in his three years. The history at St. John’s stacked up against any school’s until recently. I believe there is someone who can make St. John’s great again; I’m not sure it’s Chris Mullin. Bucknell: The Bison had some rough moments in the nonconference schedule but things have returned to normal: They’re in charge in the Patriot League. After pasting BU, 91-79, Sunday, the Bison have won eight straight and are 9-1 in the league. Cincinnati: The Bearcats have won 12 in a row and are waiting to face Wichita State to decide which school is the best team in the American. That won’t happen until Feb. 23. Kansas State: The Fightin’ Grogans have won four in a row since losing by 1 point at Kansas and are now 16-5 overall and 5-3 in the Big East. This is a pivotal week, one that can turn this into a great season. Kansas comes to Manhattan Monday night, and then there’s a trip to Morgantown to play West Virginia. Two victories could change everything. Southern Cal: The Trojans have won seven in a row and are 8-2 in the Pac 12 after sweeping the Bay Area schools. It’s their best start since 2002 and longest winning streak since 1992 when they won nine straight. Toledo: The Rockets have won seven straight and are now 15-6 and 7-1 and pose a threat to Buffalo in the MAC. Baylor: Since the Big 12 season started, the Bears have turned for the worse; they’ve lost five of their last six and seven of nine. Central Michigan: A 12-2 start seemed to indicate the Chips would be a factor in the MAC. Not so. They’ve lost six of their last seven to fall out of contention. Georgia: The Bulldogs are an enigma; they show flashes and then don’t follow through, which is the case right now as they’ve lost five of six. Missouri: A once-promising season is rapidly turning bad as the Tigers have lost three in a row and now have to go to Alabama before Kentucky comes to Columbia. North Carolina: Not sure what to make of the Tar Heels anymore; they got beat decisively at Virginia Tech, 80-69, and then lost at home to N.C. State in overtime. That’s not the résumé of a Final Four team. West Virginia: The Mountaineers have lost four of five, including two home games, and failed to protect a 17-point lead against Kentucky Saturday. THIS WEEK’S FINAL FOUR: Villanova, Virginia, Purdue, Cincinnati. I’ve added the Bearcats, the second-best defensive team in the country behind Virginia. THIS WEEK’S NATIONAL CHAMPION: Villanova.